This was one tricky bugger to get working on the Icom 7300. It wasn’t the radio, but the software. Getting WSJT-X using DXLab Suite Commander for the rig that is. Maybe it was just me, but I tried over and over to get this working. I eventually broke down and used a workaround. 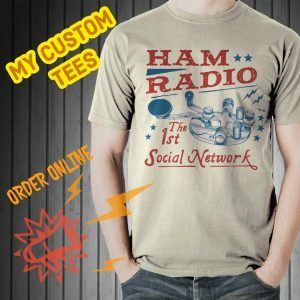 I used Ham Radio Deluxe for rig in WSJT-X and Ham Radio Deluxe was running on my laptop. You can see how this works in this video: Icom 7300 WSJT-X JT Bridge macOS Demo. I like to use “split” operation in WSJT-X. That ruled out using “none” for rig in WSJT-X. I also didn’t want to change anything in the Icom 7300 menu each time I used WSJT-X, so that ruled out using the Icom 7300 as the rig. RUMLogNG requires the CI-V connector in the menu to be set to unlink, however WSJT-X doesn’t like that setting and will not work with the Icom 7300 set as rig. So it was a catch 22. Using DXLab Suite Commander is what I saw as a solution, but I couldn’t get it working initially. That’s where the workaround came in. I used the PC with Ham Radio Deluxe running through the CI-V cable and the USB cable from the Icom 7300 went to my iMac. I’m really surprised this worked, but it did. After posting the above video with a request for help, I got a couple of good suggestions. The first came from Facebook (Patrick ON3CQ) and it was what I had done with my PC. Use two cables, one for rig and the other for data. This is very acceptable and works great. I tried it and it works without issue. However, I’m trying to stick with one cable for now. 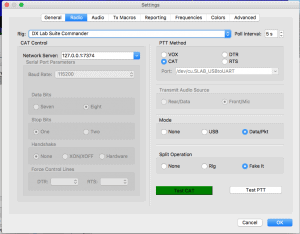 The second suggestion came from YouTube (Ron KF5JRA) and it was really just what I needed, a push to try WSJT-X using DXLab Suite Commander again. This time I saw it clearly. The ports for CAT in WSJT-X and JT Bridge. See photos on the next page. Click on the photo to enlarge the image. That’s great. It’s interesting to compare notes especially as there is so much to think about in these ‘digital’ days! Thanks again for the really useful videos. Hope we can make contact on the air sometime soon. Best 73. Bernard. I have just watched your RumLog/WSJT-X integration video on YouTube. I have everything working perfectly but do miss the extra information that JT Bridge gives e.g. LoTW and eQSL status of potential contacts. Do you miss this information or is it available elsewhere? Thanks. Hi Rich. Many, many thanks for this and all your instructional videos. I have spent several months trying to get WSJT-X, JT-Bridge and Rumlog working together. Following the instructions in your video my set up now works great! You’re a generous man Rich. I genuinely appreciate the time effort you put into creating this blog. Cheers. I was wondering if you have posted your exact settings anywhere? Saying it was tricky without saying how you solved it is unkind. Nice to hear from you. I know it can be tough finding everything. What settings do you need? There are 3 pages to the above article and the last page (pg3) has a video. See everything I have written on the iMac and software here. I am unable to make wsjt-x “talk” to my icom 7300. i have the full dxlab suite perfectly working, and i thought i would add the thrill of jt, but to no prevail. i have only a windows 7 dual screen pc. and i wish i could make it hand shake with the rig and the wsjt-x. i also was unable to make the radio ic7300 drive the icom ic2kl and its tuner automatically. i made the connection through the 13 pin connector as shown in the manual but the volatge levels to choose the frequencies are confusing the amplifier. any ideas? Wow that’s a good question and I have no idea about the amp. Try the YaHoo groups “Icom 7300” and I’ll bet one of those guys have done that and will know.